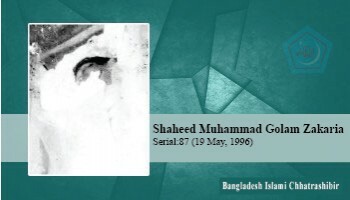 Muhammad Ghulam Zakaria was a dedicated activist of Bangladesh Islami Chhatrashibir. His love and his dream towards the organization was huge. Remarkable words of martyr: 'Insha Allah' I will continue to work for Islam in exchange for life. On July 29, 1996, the holy day of 12 Rabiul Awwal was Monday. BCL activists killed Sitakunda College HSC examinee Mohammed Shahjahan, and brutally murdered him. Mohammad Shahjahan was the eldest of two sons and two daughters of Hanif Sodagar of Haitkandi village in Mirsarai thana.